A young cardinal is featured in the picture atop this entry, and as you can see, this bird has already learned about one of the bird feeders in my rooftop garden. Readers might recognize the image, as it is featured in the book, Words In Our Beak Volume One. In any event, the young cardinal seen in the image atop this entry is molting. This a topic is not discussed in volume one, however, I discussed in yesterday's blog post in terms of its affect on adult cardinals as well as young blue jays. This entry is a follow up to the one I published yesterday. I want to use the opportunity to provide you with some interesting facts re young cardinals. According to an article by Dan Harkins (in science.com) "All northern cardinal hatchlings are born with pink skin and grayish scaling. No red is evident in either the male or females. 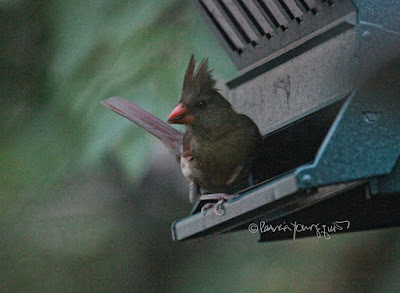 As molting begins, however, baby cardinals take on a tan hue that remains well into their juvenile period, when color changes in the male begin to differentiate the two genders. Also, baby beaks are uniformly black and fade to a coral red through the molting period." 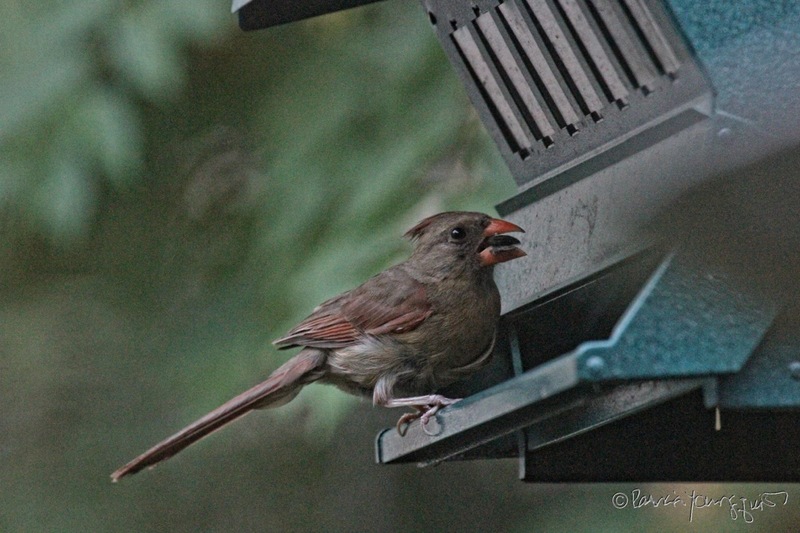 Harkins goes on to explain that "When juvenile northern cardinals grow their feathers in the fall, their gray and tan tones slowly change to mottled light browns and soft reds. Red grows faintly into the tail and wing feathers of both genders, but only the males show bold uniformity in the red that grows into the main torso and head feathers. Females will grow mostly light brown or grayish feathers in these areas. Both genders of juvenile will develop black masks around mostly black beaks during this period." 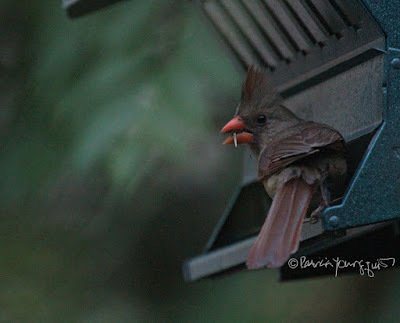 Images of a young cardinal going through the aforementioned stage, can be seen directly below where she is at one of my "house-style feeders." 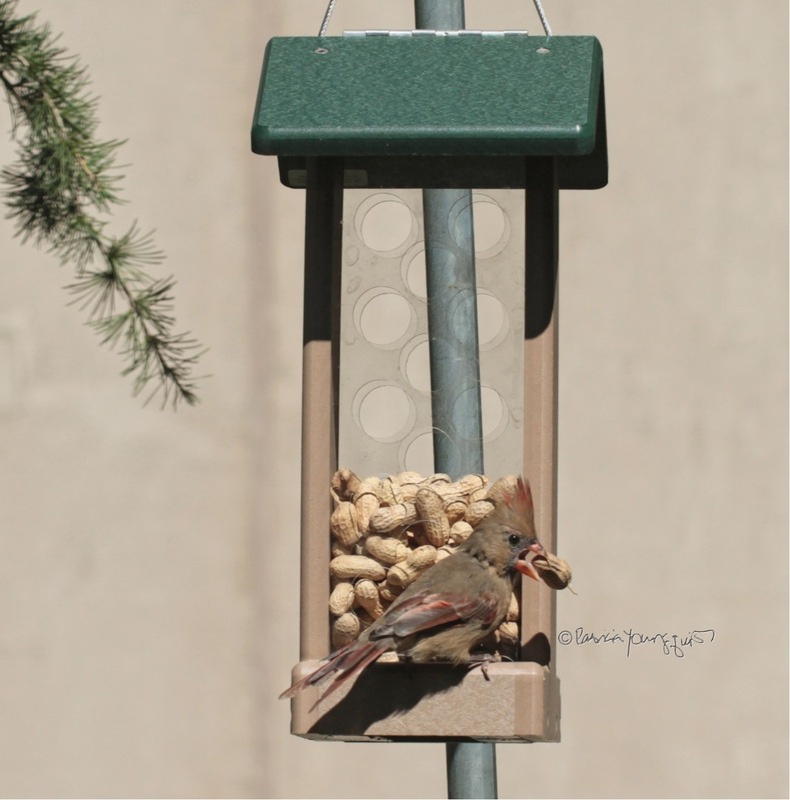 I certainly hope this cardinal will make regular visits to my place, but no itinerary has been revealed to me, so I truly have to focus on these special visits, whenever they happen.